The first novel in a sweeping historical trilogy, beginning in rural, pre-WWI England. Mr. Pears has not only engaged in prodigious research to bring this vanished world to life; he has so thoroughly absorbed his research that he seems to be recalling what he describes from his own experience. You might think he was crouched under a table listening to what is said ... I look forward to reading these promised volumes, for this is a wonderful novel. As with all good fiction, especially—strange as it may seem—the best fiction, echoes of other novels sound in your ear...the novel which came persistently to mind as I read this was another masterpiece of the years before World War I, Alain-Fournier’s Le Grand Meaulnes. The settings and stories are very different but, like Alain-Fournier, Tim Pears combines a down-to-earth rendering of the realities of rural life with a magical sense of another world beyond our everyday experience. Tim Pears’ new novel, the first in a trilogy, is a slow read. Not because it lacks suspense, but because the pleasure of it lies in taking in the language and the setting – the West Country, in 1911 and 1912 – and in reading it like a long poem, with each chapter a stanza ... As a protagonist, Leo is worth observing, but he is not especially sympathetic. Miss Charlotte is just about the only other character he interacts with. Pears’ habit of setting Leo so firmly in his environment has a downside as well as an upside – it’s easy to lose sight of him, which turns The Horseman into more of a tableau vivant than a narrative. And it is not as though the early 20th century hasn’t been thoroughly mined by English writers already. But Pears specialises in going his own way and doing the unexpected, so I am ready for volume two. ...substantial enough to be a stand-alone novel and a vital first installment. Pears steadily and satisfyingly branches out, unfurling his canvas and introducing characters we want to see more of, plus a raft of unresolved issues and emotions ... As with Thomas Hardy’s pastoral pockets of Wessex, Pears delineates a specific topography, conveys a rough-and-smooth mode of living and gives voice to an all-important manner of speaking. His lucid prose is peppered with colorful regional dialect ... The lay of Pears’ land is the other main delight of this beautiful and engaging novel. Bring on the second act. 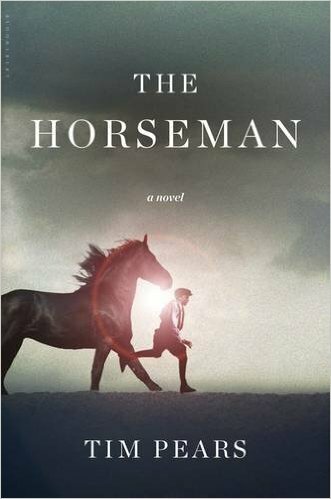 What did you think of The Horseman?